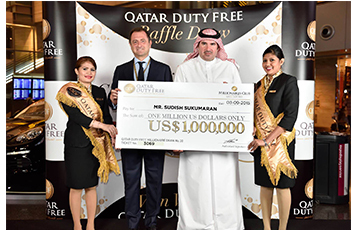 DOHA, Qatar, 2015-9-24 — /Travel PR News/ — Qatar Duty Free is delighted to announce that the winner of its US$1 million prize draw in September 2015 is Mr Sudish Sukumaran. Mr Sukumaran is Qatar Duty Free’s 20th winner of the Millionaire Draw held at Hamad International Airport (HIA), Doha. Both prize draws were conducted at Hamad International Airport and were presided over by Qatar Duty Free’s Vice President of Branded Stores, Mr Luis Gasset and Hamad International Airport’s Vice President Commercial – HIA, Mr Abdulaziz Al Mass. The Qatar Duty Free Millionaire Draw is a highly popular promotion with only 5,000 tickets sold for each prize draw, and has continued to generate a tremendous response from passengers since its introduction in 2006. Future opportunities for departing and transit passengers to purchase US Dollar Millionaire raffle tickets, are also available online. For more details on how you could win a luxury car, visit https://www.qatardutyfree.com.qa and buy a ticket from Qatar Duty Free. The winning millionaire ticket was number 3069 and the winning luxury car ticket was number 0511. At Hamad International Airport, Qatar Duty Free offers 40,000 m2 of combined retail, food and beverage facilities, establishing the retailer as a premier shopping and dining destination. With more than 70 retail outlets offering an unprecedented selection of designer labels, fashion, electronics, gourmet foods and much more, Qatar Duty Free at Hamad International Airport caters to all passengers’ tastes. In addition, more than 30 cafes and restaurants offer a sumptuous selection of global and local cuisine. Qatar Duty Free (QDF) operates out of Hamad International Airport (HIA) in addition to an outlet at Doha Port. The innovative, award-winning duty free operator has enjoyed consistent double-digit growth year-on-year and is now the second largest duty free operator in the Middle East. In April 2015, QDF won the Global Travel Retailer of the Year category at the DFNI Global Awards, for the third year in a row. Hamad International Airport’s Vice President Commercial – HIA, Mr Abdulaziz Al Mass (second from right) and Qatar Duty Free’s Vice President of Branded Stores, Mr Luis Gasset (second from left) hold a cheque in the amount of one million USD for Qatar Duty Free’s 20th winner of the Millionaire Draw. This entry was posted in Airlines, Airports, Travel Management, Travel Marketing, Travelers and tagged Keith Hunter, Mr Abdulaziz Al Mass, Mr Luis Gasset, Qatar Duty Free Millionaire Draw, Sudish Sukumaran. Bookmark the permalink.